When I was in college, I went on a retreat. One of the skills I learned during the weekend was basket weaving. It was a lovely art, both in what I ended up with, and how I got there. In other words, the process led to a product I was proud of: a tightly woven basket with an intricate design of my own creation. Writing a novel, I find, parallels that experience. The warp of my story is the primary structure, and the woof is the way I hold it together by weaving in and out of the structure with the scenes and details that make it distinctly my own design. Sometimes, I make an impulsive change in the course of the weaving of my tale, which then affects the entire design, and I end up with a different – but even better – story than I had anticipated; sometimes, I find the change is a mistake, which means I have to unravel back to that point and make corrections. Unlike crafting a basket, however, the task of weaving a story gives me a dimension of creativity the basket doesn’t allow: I can add in even more layers – more woof – after my initial story is complete. 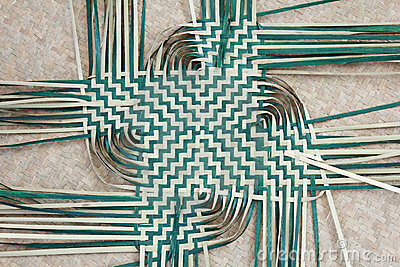 When I finish a basket, the weaving is of one piece – I can’t cut out a section of threads and replace it, or expand it, and expect the basket to hold together. With writing, though, I find the extra woof is what gives the story its defining success. In revision, I can add a new character to further complicate the plot or add comic relief. While the main structure of the work doesn’t change, that new character can help breathe more interest into interactions with, and between, other characters. In the case of my mysteries, I often create a character in the revision process who can help move my story through spots that are weak or slow, especially when I need some red herrings thrown in to mislead my readers. I created one such character in my first book as a last-minute thought to complement one of the subplots, only to have readers so enjoy the character, that they repeatedly asked me to bring him back in a later book! Adding in subplots that reflect the primary plot is another trick to elaborating on my initial story design. When revising, I try to give almost every character some personal issue that can tie into another character’s. Doing so not only makes the characters more real – who, in real life, doesn’t have problems to deal with? – but it affords me more opportunities to weave in conflict, which adds to the story’s pacing. My solution to keeping track of the characters and subplots is the creation of a master flow chart that follows each element of the story from beginning to end. That way, I accomplish every weaver’s goal: no loose ends. What are your favorite threads to add to the warp and woof of your writing? This entry was posted in Fiction, Writing and tagged fiction, Jan Dunlap, writing fiction by jandunlap. Bookmark the permalink. Jan– Clevah, clevah! And quite informative, too. You’ve taken a frequently used analogy and made it into a fun teaching tool. Thank you, Samuel. I forgot to mention something key about the two crafts, though. It takes a lot longer to weave a plot than a basket! haha your secret is safe with me 😉 Lectures are great too, though I think what I enjoyed most was the round table discussions with my writing professors and the other students. Something about open discussions really gets the juices flowing. I am doing that additional step right now. I thought I was finished, but my readers all wanted to know more about a character, so woof! woof! Good for you, Kathie, to go back and weave in more! I always dislike it when I finish reading a book feeling like something was missing – good readers are our best critics, I think! I enjoy using subplots. I like that element in books I read too. It’s a great distraction from the main plot but still allows your characters to dig in their cause without letting your readers know that’s what your doing. Subplots also make a great breathing moment for our characters. I like to run mine through the the mud so whenever I can give them a rinse , I let them breathe. But just for a moment. Your poor characters! I try to let mine kick back and have a beer now and then…and use that time for deepening the subplots. Thanks for stopping by! I really enjoyed your post. I have woven baskets and rugs but I have never thought about it regarding my writing.Thanks so much for sharing. I found it very informative.